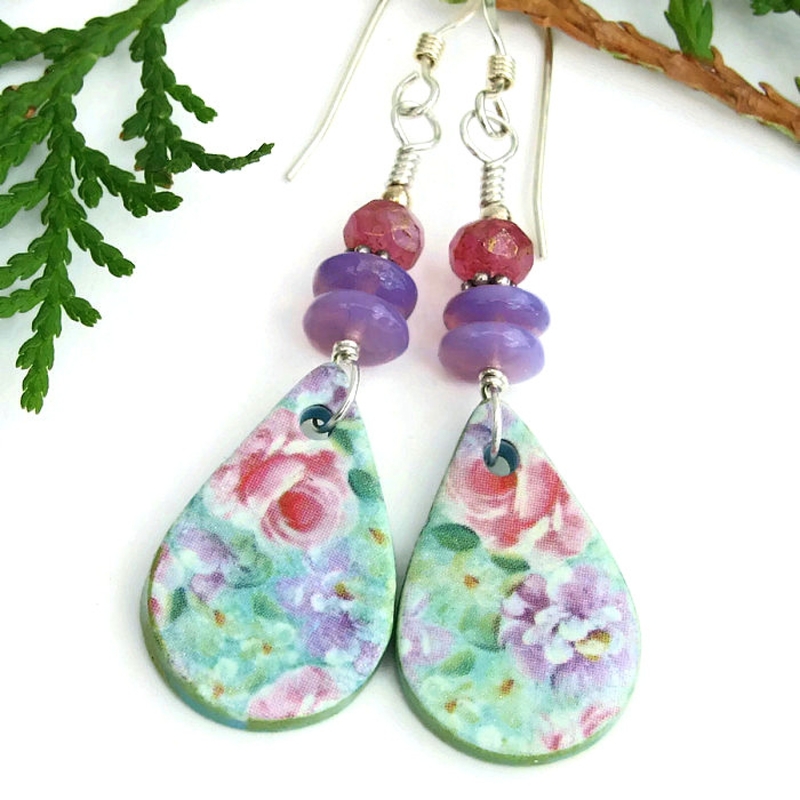 Sweetly Victorian inspired with their abundant floral charm, the unique LUXURIANT FLOWER GARDEN handmade earrings are a perfect gift for the gardener and for the woman who loves to stroll through the romantic beauty of roses, peonies and other flowers. 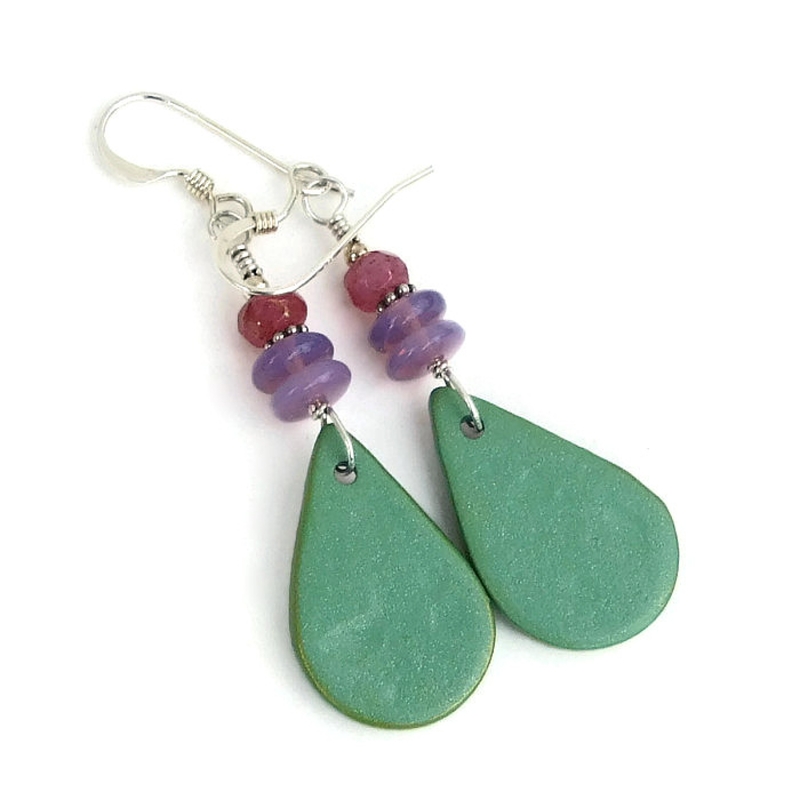 The colorful earrings feature artisan made minty green polymer clay teardrops. The lightweight teardrops have a permanent flower transfer on the front side. 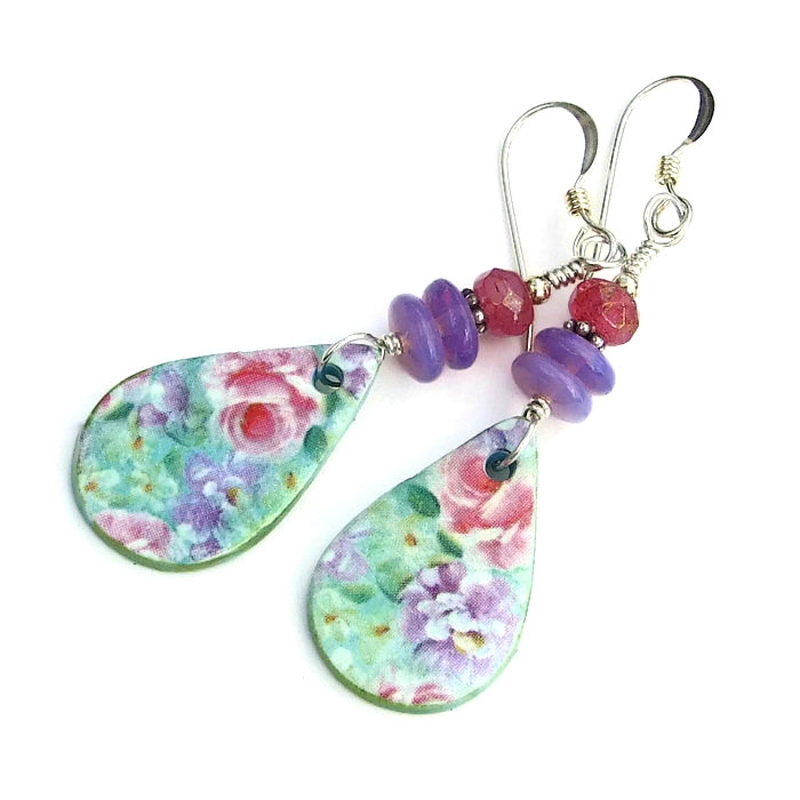 Stacked above the teardrops are glowing violet purple opal Czech glass discs and faceted dark pink Czech glass nuggets. Sterling silver earwires finish the beauties. 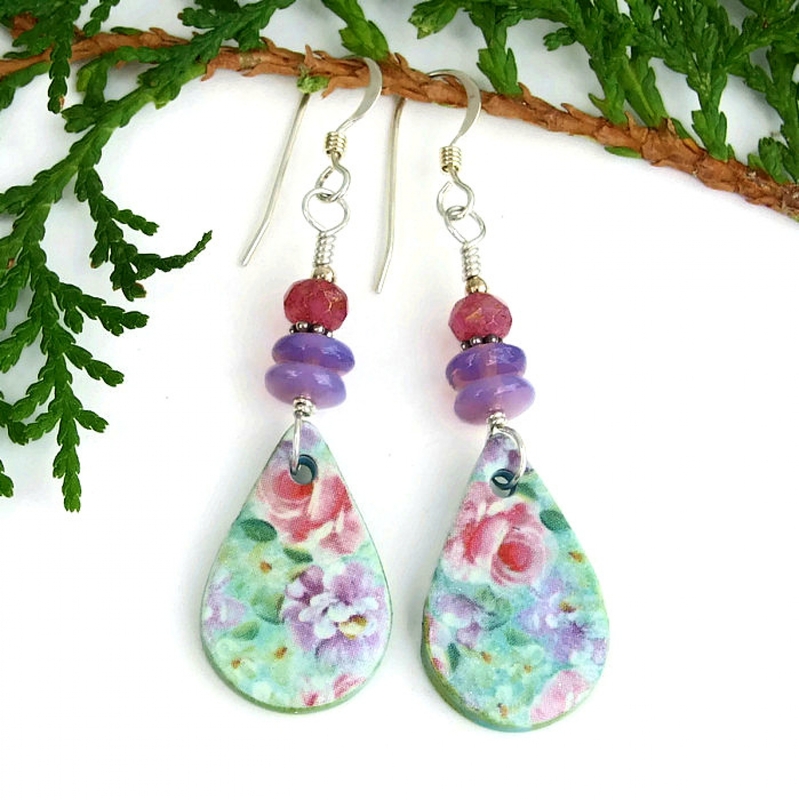 The one of a kind LUXURIANT FLOWER GARDEN earrings were carefully designed and handmade by Catherine of Shadow Dog Designs for the woman who adores flowers and loves to wear one of a kind jewelry. 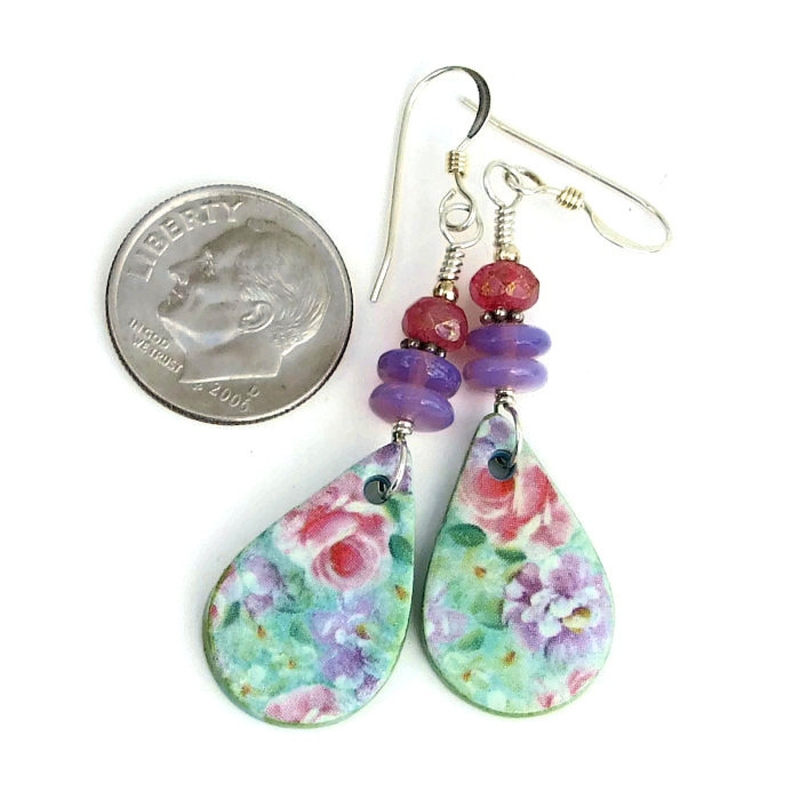 *** For a better understanding of the relative size of the LUXURIANT FLOWER GARDEN handmade earrings, please be sure to check out photo # 6 for a size comparison with a dime. 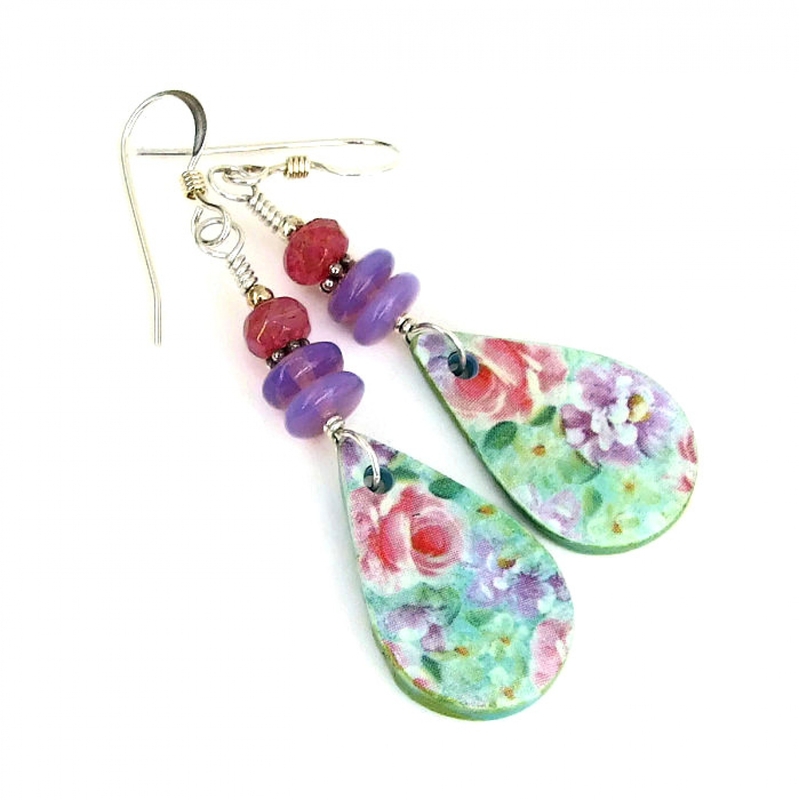 The amazing rounded teardrop dangles used in the LUXURIANT FLOWER GARDEN handmade earrings were individually created by polymer clay artist Susana Paredes. 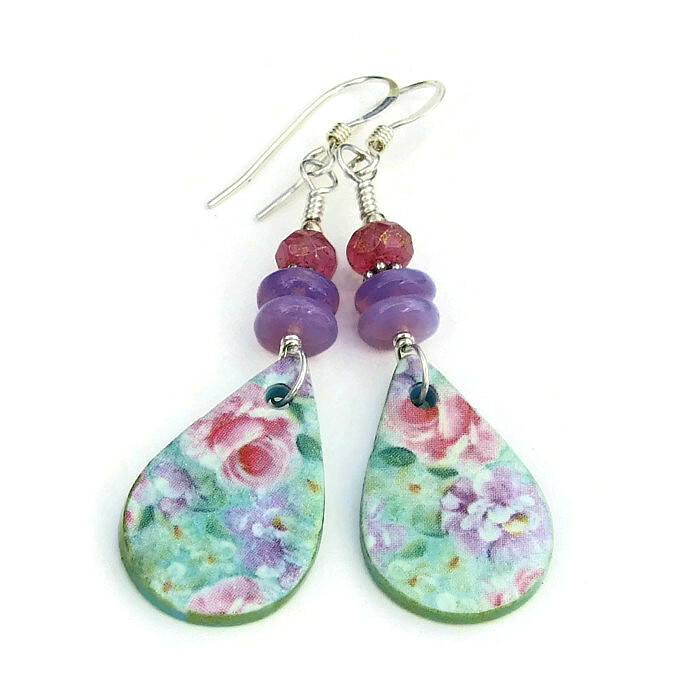 Polymer clay is a lightweight but durable artist’s clay, a versatile medium with which to work. The polymer clay used to make the teardrops is a minty green color with shimmering mica sparkles. 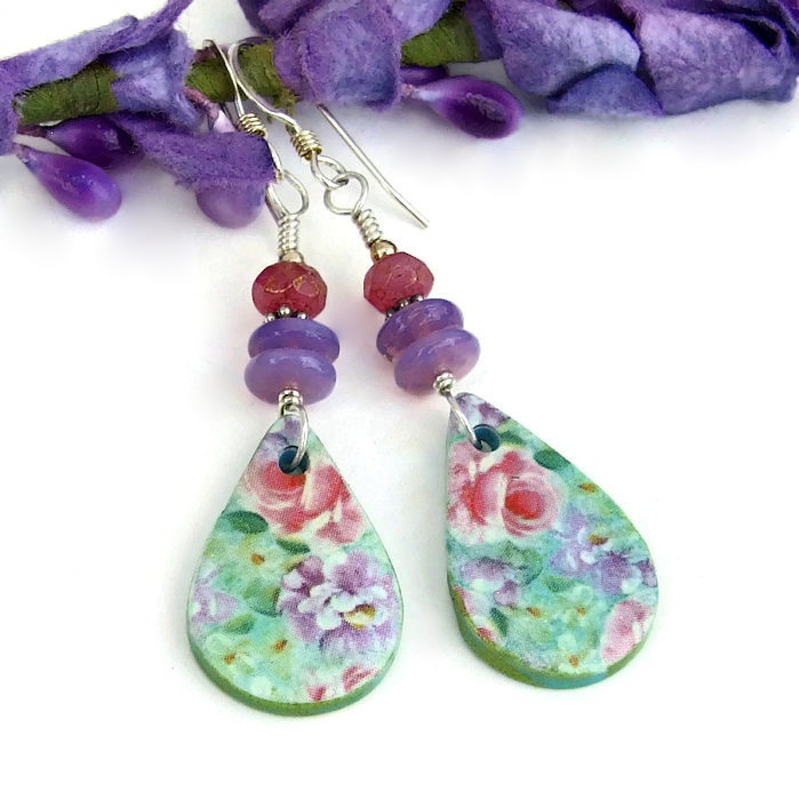 A permanent floral polymer clay transfer was applied to each dangle. The flowers in the peaceful Victorian scene are mainly purple and pink: pink roses and purple peonies with very pale yellow what looks to be violets. Several layers of sealant was applied to protect the design. 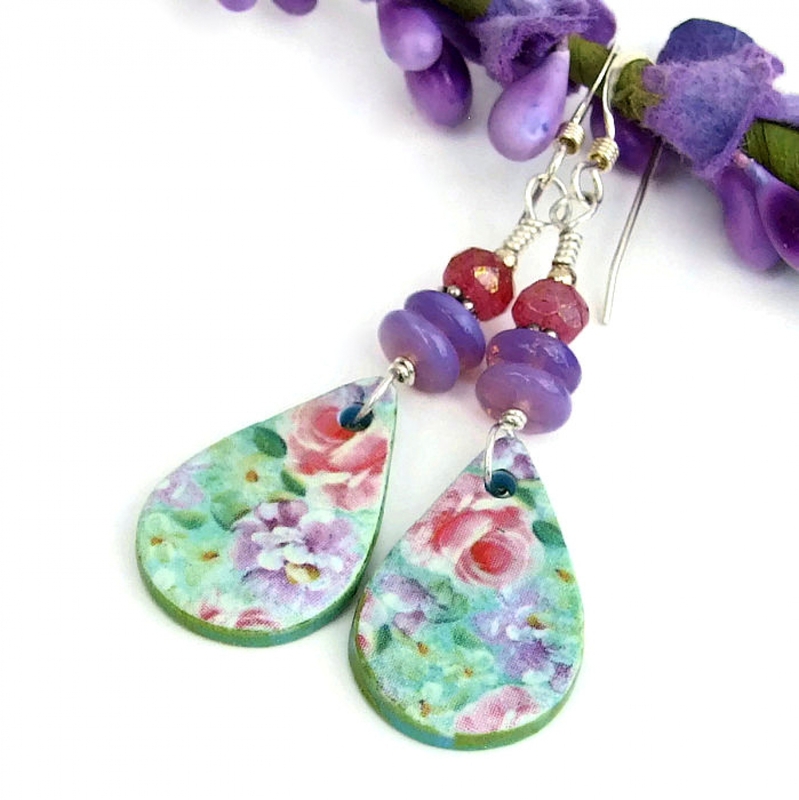 The flowers are on one side of the dangles only - the backside is smooth, subtly sparkly mint green polymer clay. 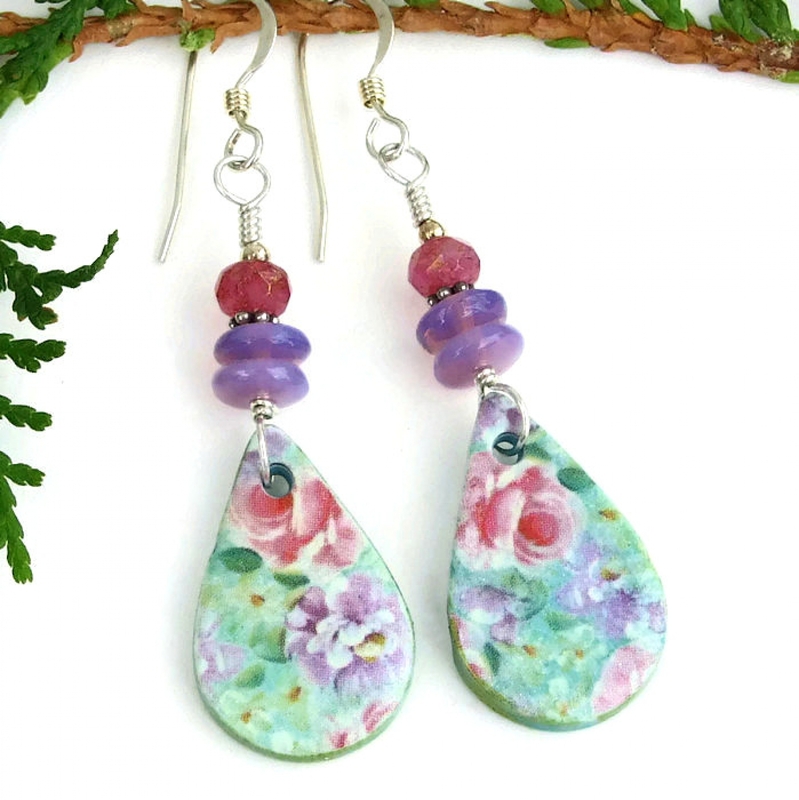 Because the dangles are made from polymer clay, the earrings are very lightweight to wear, great for those who have issues with wearing heavy earrings. The dangles were carefully wire wrapped with sterling silver wire to attach to the upper part of the earrings. To add great texture and color to the earrings, two translucent Czech glass rondelles were stacked above each flower teardrop. The eye catching glass is called “violet opal” because they glow like real opals and can have a slight color shift, especially when back lit. 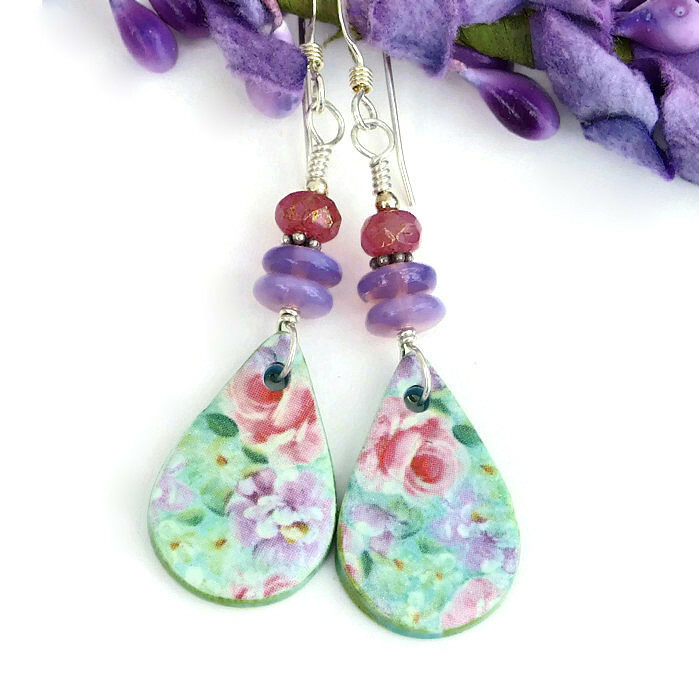 Above each set of violet opal discs, separated by a sterling silver daisy spacer, are a single dark pink Czech glass nugget. The nuggets are faceted and have a slight metallic Picasso finish, causing them to add subtle sparkle to the design. A single sterling silver 2 mm bead caps the top of the pink beads. All of the elements used to create the LUXURIANT FLOWER GARDEN earrings were strung on sterling silver wire, the upper end carefully wire wrapped into a loop. The loop was connected to sterling silver French hook earwires for a perfect finish to the unique earrings. Through the centuries, flowers have been a symbol of spiritual awakening; also they have been symbols of generosity and love when they are given away. Even though man made, glass carries the energies of transformation, rebirth and communication. Silver is a metal of love and healing; it is a mirror to the soul, helping us to see ourselves as others see us. 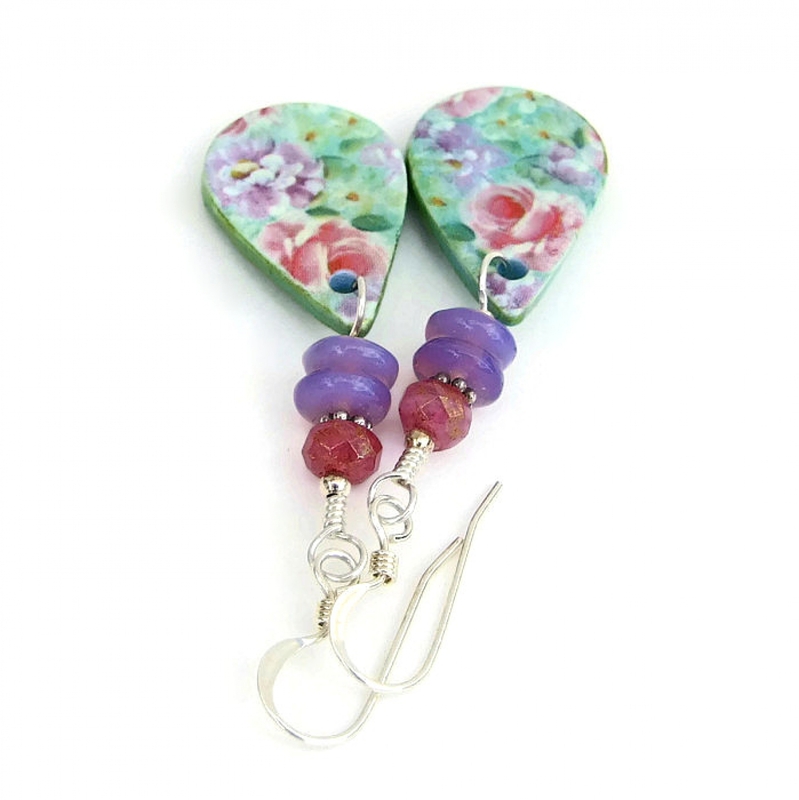 The LUXURIANT FLOWER GARDEN one of a kind earrings were carefully designed and handmade in a dog friendly, smoke free studio. They will be carefully packed in an organza jewelry bag with tissue, perfect for gift giving to a loved one . . . or to yourself!